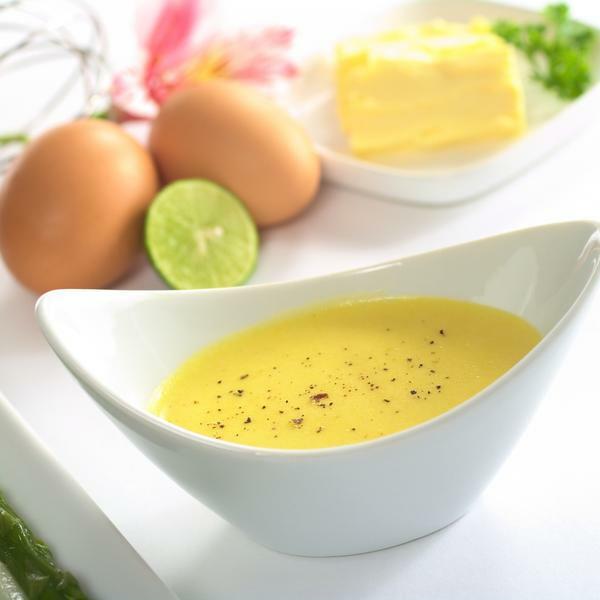 Hollandaise sauce is a rich, lemony sauce made with butter and eggs, most famously served with eggs Benedict. There's no reason why you can't spread this delicious sauce on a variety of vegetables, soft-baked breads, and fish such as flounder, Pollock, cod, and salmon fillets. While white fish will have a much milder flavor, salmon will add a deeper richness to the sauce. Whether you choose to use it with white fish fillets or thick red salmon steaks, perfecting the art of fresh hollandaise sauce is sure to satisfy friends and family alike. Our traditional recipe is easy to follow and simple to prepare, so let's dive in. Hollandaise sauce can be a bit tricky to perfect, but it's usually a matter of trying to race through the process and ending up splitting the sauce. If you take it slow and pay attention, yours will turn out smooth and perfect every time. The key is to be sure the sauce doesn't heat up too fast and split—it looks a bit like curdled milk and scrambled eggs when it splits, and that doesn't look or taste good. Just relax, go slow, and don't try to rush through this. It'll be well worth the wait when you've spread this warm, rich sauce over your favorite white or red fish. In a small sauce pan, melt butter. Remove from heat and let cool for 2 to 3 minutes. 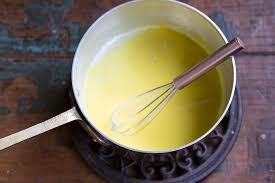 White milk solids will have formed in the melted butter—remove those with a spoon. Some will remain at the bottom of the pan, but don't try to get it all out yet. Pour the melted butter fat slowly into a measuring cup, being careful to only get the butter fat and not the remaining white milk solids or the water. In a large sauce pan, add 2 – 4 inches of cold water and bring to just a simmer. Add egg yolks to mixing bowl. Add remaining ingredients to eggs. Place bowl over simmering water, making sure the bowl doesn't touch the water. Whisk the egg mixture vigorously, adding as much air as possible. When mixture begins to peak, about 2 to 5 minutes, remove bowl from heat. Slowly add butter, continuing to whisk as you drizzle the butter. If your sauce breaks, don't panic. 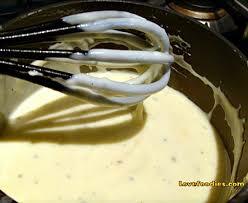 Add a tiny amount of water and whisk until the sauce comes back together. Finish adding butter and whisking until smooth and light. Add the lemon zest if you like, and serve over baked or roasted fish.